Okayafrica caught up with founders of Noirbnb and Innclusive, formerly Noirebnb, to learn about their alternatives to Airbnb. UPDATE: This story previously reported that Noirebnb had plans to change its name, but one hadn't been decided yet. Wednesday, the founders announced they have changed the name of Noirebnb to Innclusive. Adage “great minds think alike” rings true when it comes to new lodging service startups: Noirbnb and Innclusive, formerly Noirebnb. Besides the obvious— previously Noirbnb and Noirebnb, now called Innclusive essentially shared the same name ("noir" or "noire" are French for black)—both companies were born from firsthand encounters with discrimination, part of a larger conversation using viral hashtag #AirbnbWhileBlack that details those experiences while using online lodging service mammoth, Airbnb, which has an estimated worth of $10 billion and more than two million listings. What’s more, both companies base their operations out of Washington, D.C. and Florida (Noirbnb in Miami and Innclusive in Tampa), and one set of the founders from each venture have uncannily similar first names: marketing professional, Ronnia Cherry, 30, of Noirbnb and serial entrepreneur, Rohan Gilkes, 40, of Innclusive. And both Gilkes and Noirbnb co-founder, Stefan “StefisDOPE” Grant, 27, are Caribbean-born. At the time of this interview, the startups founders' were in conversation about a possible merger. However, Wednesday Noirebnb announced a name change to Innclusive. Noirbnb has been in the works since October 2015 after Grant, a musician and producer hailing from Jamaica, rented an Airbnb property in Atlanta, Georgia during a music festival when neighbors (possibly acting on unconscious bias) called the cops on him and his crew, assuming a robbery was in progress. Two cops showed up reportedly with guns drawn, Grant says, but he was able to luckily negotiate his way out of what could have been a potentially deadly encounter—eventually taking a Snapchat selfie with the officers that went viral. Airbnb sought to rectify the traumatic situation with free booking offers and flights for Grant and his business partner, Cherry, to its San Francisco headquarters in November. But, as he tells Forbes, “They were trying to smooth it over, but we knew that that wouldn’t solve the issue.” So Grant and Cherry decided to build out—what was supposed to be an Airbnb diversity program—independently. Since Noirbnb's soft launch June 3, Grant and Cherry say, the site has attracted tens of thousands of subscribers. At https://t.co/tzw7MS3Pvu we're about uniting people & creating an inclusive environment where all people can feel safe & welcome. Gilkes, originally from Barbados, came up with the idea for Innclusive, a few weeks ago, when he received an overwhelming response about his #AirbnbWhileBlack experience that he chronicled on Medium after an Airbnb host denied his request for a stay in Idaho, but then agreed to rent the space to his white associate. At the time of this interview and ahead of its hard launch, Gilkes says Innclusive has garnered 23,000 subscribers and counting. Founders of both startups haven’t been content with only complaining about their negative experiences with discrimination, but are angling to offer a solution, so travelers of color like them, can skip any racially motivated drama and have a more inclusive alternative to Airbnb. Stay tuned this summer as both companies plan to officially launch in the coming weeks. Okayafrica caught up with the founders Grant and Cherry of Noirbnb as well as Gilkes of Innclusive (his partner, strategist Zakiyyah Myers, 40, wasn't on the call) Thursday to learn more about their respective visions for revolutionizing short-term lodge services for black travelers around the world. Here’s what they have to say. These interviews have been edited and condensed. Erin C.J. Robertson for Okayafrica: Could you tell me more about your company and your offerings? 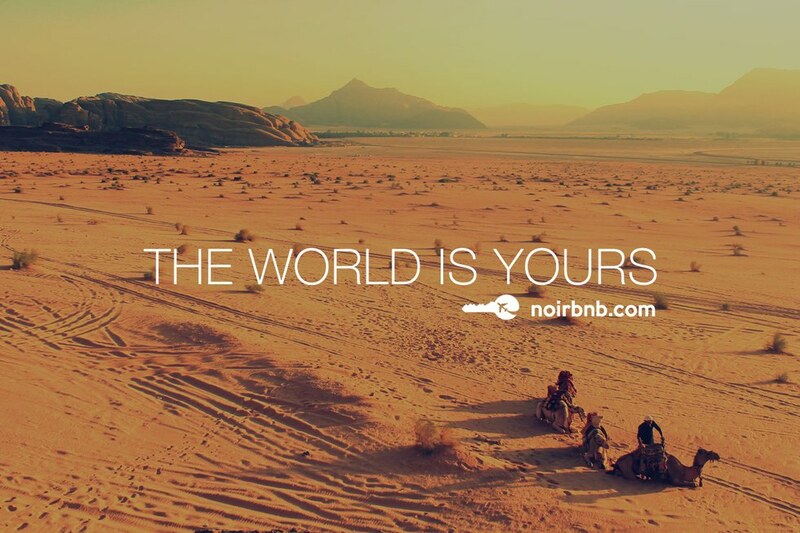 Noirbnb (Stefan Grant): Really the goal is just to not only provide an awesome service for the Americans and Africans around the world, we really want to connect each other. We're a global people, and I feel like this generation is probably going to be one of the ones to travel the most—if we're not already that way. It's just about making sure that we can provide an awesome service and platform to really connect with each other on a more global level. Innclusive, formerly Noirebnb (Rohan Gilkes): Our product is very similar in function to Airbnb where someone can come and find some place to stay. We're a company that's looking to speak to people that have felt marginalized or discriminated against. Ratings speak and build discrimination control that really can help alleviate some of those issues that I've seen in the news and on Twitter and everywhere else. That's the super high-level. How do you plan to tailor your lodge-matching service to black travelers and the travel experience they're hoping to have culturally? Noirbnb (Ronnia Cherry): It's not even just about being a black traveler. It's about being a business traveler. It's about being a woman traveler, a black man traveler. There are so many different segments that come along with being a person, period. We're monitoring the comments out there, [seeing] what are the questions, what are the concerns and some of the jokes that people make just so that we can get accustomed to what people want and what clients want. Then every day we're updating [our] business model and platform. Innclusive, formerly Noirebnb (Rohan Gilkes): Okay, so these travel groups, right? There's a lot of them. Travel Noire is a big one. Nomadness Tribe is another big one. And their [followers] are people of the diaspora that are just travelers and they go away every year. And a lot of their travels are often based around some type of event. They're often going to see the jazz festivals and shows. We can start with targeting our market with email blasts and highlight all the things that are included. That's something that no other platform does. What do you have planned pertaining to Africa and the Caribbean? Noirbnb (Ronnia Cherry): Even when we spoke to the black employees at Airbnb we let them know it's so important for African Americans to travel to the continent of Africa. I think we need to experience that. So we're definitely doing what we can to help people travel in Africa and the Caribbean. Innclusive, formerly Noirebnb (Rohan Gilkes): Based on our network we have found people or people we already have relationships with in certain countries. After we get a grip [in the U.S.] we can start to go international, looking at the Caribbean is perfect. I looked at what's in Africa. We have a contact in Ghana and South Africa. On the east, Tanzania and Kenya as well. We have people on the ground, so that's what's going to happen and I know they're probably more countries that we're looking at based on our current network. Do you think the market for black travelers is large enough to be sustainable as you scale? Noirbnb (Stefan Grant): The funny thing is when we first met with Airbnb, we were like look, the African American spending power alone is 1.1 to 1.3 trillion dollars and the black travel market is a $50 billion industry. I would say that's totally scalable. Innclusive, formerly Noirebnb (Rohan Gilkes): The short answer is 'yes.' The black traveling market is a $15 billion market. It's already huge and it's actively growing as well. With a nexus of black owned businesses and black empowered ventures popping up, do you think it could lend itself to justifying exclusion or furthering alienation? Noirbnb (Stefan Grant): To be completely frank it wasn't about separation. Some people, I guess like one percent of the people responded that it was 'resegregation.' At the same time, what people don't understand is that it's important for black businesses to exist and for black people to create that economy because if we're being real about it, the economy is what helps the culture. We're about trying to provide economic opportunity and making sure that whatever we're doing can actually help benefit the community in more ways than one. It's totally about making sure that people can feel safe and welcome while traveling and connecting with black people around the world. This isn't to put down anyone else or to hate on anyone else. It's just about making sure we're good. Innclusive, formerly Noirebnb (Rohan Gilkes): You’re absolutely right that there is an underlying movement. It's happening not only by race, but also by sexual orientation, by gender identity where people are looking to create more control of their lives and how they're being treated, and so on. While it may look like a type of segregation, I think of it more as a response to discrimination and prejudice. People can either say let me stay on this platform, [Airbnb], when I go through all these micro-aggressions or let me go out and live a fuller life and be in a sacred space, be happier, and treated with respect. I see nothing wrong with me taking that action instead of just being beaten down and mistreated forever. Now people have the ability to make their own decisions and make some changes and build things themselves. So until we have more equal union or better treatment for people for something that we have no control over, you're going to find things popping up like Misterbnb, Latin@ groups, Asian American groups, African American groups and so on. To learn more about #AirbnbWhileBlack, watch AJ Plus' video here.